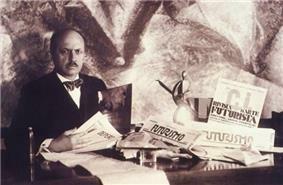 Filippo Tommaso Marinetti, author of the Futurist Manifesto. The Manifesto of Futurism, Italian: Manifesto del Futurismo, written by the Italian poet Filippo Tommaso Marinetti, initiated an artistic philosophy, Futurism, that was a rejection of the past, and a celebration of speed, machinery, violence, youth and industry; it also advocated the modernization and cultural rejuvenation of Italy. Marinetti wrote the manifesto in the autumn of 1908 and it first appeared as a preface to a volume of his poems, published in Milan in January 1909. It was published in the Italian newspaper Gazzetta dell'Emilia in Bologna on 5 February 1909, then in French as Manifeste du futurisme (Manifesto of Futurism) in the newspaper Le Figaro on 20 February 1909. The limit of the Italian literature at the end of the "Ottocento" (19th century), its lack of strong contents, its quiet and passive laissez faire, are fought by futurists (see art. 1, 2, 3), and their reaction includes the use of excesses intended to prove the existence of a dynamic surviving Italian intellectual class. In this period, in which industry is of growing importance in all Europe futurists need to confirm that Italy is present, has an industry, has the power to take part in the new experience, and will find the superior essence of progress in its major symbols: the car and its speed (see art. 4). (Nationalism is never openly declared, but is evident). Futurists insist that literature will not be overtaken by progress; rather, it will absorb progress in its evolution, and will demonstrate that such progress must manifest in this manner because Man will use this progress to sincerely let his instinctive nature explode. Man is reacting against the potentially overwhelming strength of progress, and shouts out his centrality. Man will use speed, not the opposite (see art. 5 and 6). Poetry will help Man to consent his soul be part of all that (see art. 6 and 7), indicating a new concept of beauty that will refer to the human instinct of aggression. The sense of history cannot be neglected: this is a special moment, many things are going to change into new forms and new contents, but Man will be able to pass through these variations, (see art. 8) bringing with himself what comes from the beginning of civilization. In article 9, war is defined as a necessity for the health of human spirit, a purification that allows and benefits idealism. Their explicit glorification of war and its "hygienic" properties influenced the ideology of fascism. The Futurist Party, for example, became part of the Combatto Fascisti before the latter's assuming power. F. T. Marinetti was very active in Fascist politics until he withdrew in protest of the "Roman Grandeur" which had come to dominate Fascist aesthetics. Article 10 states: "We want to demolish museums and libraries, fight morality, feminism and all opportunist and utilitarian cowardice." 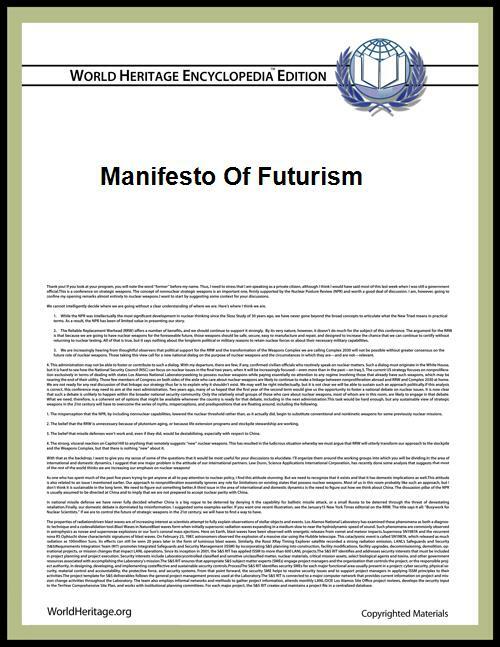 This manifesto was published well before the occurrence of any of the 20th Century events which are commonly suggested as a potential meaning of this text. Many of them could not even be imagined yet. For example, the Russian Revolutions of 1917 were the first of the sort "described" by article 11, yet the first of those occurred eight years after the Manifesto's publication. The effect of the manifesto is even more evident in the Italian version. Not one of the words used is casual; if not the precise form, at least the roots of these words recall those more frequently used during the Middle Ages, particularly during the Rinascimento. The founding manifesto did not contain a positive artistic programme, which the Futurists attempted to create in their subsequent Technical Manifesto of Futurist Painting (1914). This committed them to a "universal dynamism", which was to be directly represented in painting. Objects in reality were not separate from one another or from their surroundings: "The sixteen people around you in a rolling motor bus are in turn and at the same time one, ten four three; they are motionless and they change places... The motor bus rushes into the houses which it passes, and in their turn the houses throw themselves upon the motor bus and are blended with it." ^ "Technical Manifesto of Futurist Painting". Unknown.nu. Retrieved 2011-06-11.